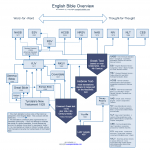 There are more than 50 English Bible translations in circulation by some estimates. We have provided a chart to provide information on some of the most common translations. This chart attempts to show the degree to which a translation conforms to the original languages and the source and ‘pedigree’ of the given translation. This chart does not attempt to evaluate translations, but rather to expose translation philosophies. For the best image of this chart – click here. 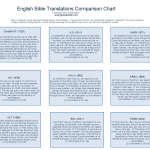 If you would like to see a comparison chart of a selection of these translations please click here. Incidentally, even a cursory study of English Bible history shows the importance of William Tyndale, whose translation of the New Testament in 1525 (under bitter persecution) formed the fountainhead of subsequent English translations. For an excellent essay on this subject please read Daniel. B. Wallace’s Essay, Why So Many Translations? Dynamic Equivalence: translation's premium is on the thoughts and ideas expressed in passages, rather than translating each phrase word-for-word. The focus of this philosophy is to make the meaning of each Scripture reference accessible to modern readers. This philosophy is necessarily interpretive. Translations that follow this general philosophy: (NLT, CEV, NJB) The NIV uses both dynamic and formal equivalence. Formal Equivalence translation philosophy places a premium on word-for-word translation - preserving as much syntactical structure from the original languages as possible. These translations are less interpretive than 'dynamic' translations. Translations that are known to follow this general philosophy : KJV, NKJV, NASB, ESV, RSV, NRSV.